I just had to share this with you all. It's absolutely brilliant! The Burren's iconic dolmen Poulnabroune has been artistic crafted as a bouncy castle! Commissioned by Galway County Council and supported by the Arts Council, the 'Poulnabroune Bouncy Dolmen' was inflated by artist Jim Ricks today in Kylebrack woods, southeast of Loughrea, co. Galway and is about twice the size of the pre-Christian stone tomb. This is part of a project which involves three artists (including Ricks) who have been invited to create temporary artworks that engage with the communities in the Aughty region of the county in a creative way. (it's quite unique to find a dolmen in that region, as they don't actually have any there...only wedge tombs.) Ricks worked with a bouncy castle manufacturer in the UK to create the bouncy dolmen, which has been finished to professional standards, so it is perfectly safe for children to bounce on. Poulnabroune Bouncy Dolmen was on disply at Kylebrack woods today between 4.30 and 6.30. 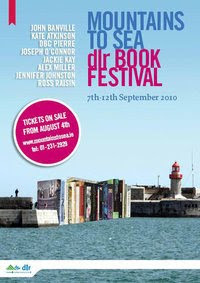 It will also be present at Portumna Castle on September 19th as part of the Shorelines Art Festival. Fantastic! This article was publish in last Saturday's Guardian Review (August 21st). David Almond, one of our most treasured and brilliant children's author, spoke to Sarah Crown about 'A Life In Writing', where he revealed a bit about his life, his influences and his writing. His great success first appeared with the publication of 'Skellig'; a totally absorbing "small tale" about a young boy, Michael, whose completely normal life is thrown assunder by the birth of his baby sister, whose is extremely ill. As he tries to make sense of what is happening in his world, he finds " a skinny, pale, black-suited creature, 'covered in dust and webs....dead blue-bottles scattered on his head and shoulders." 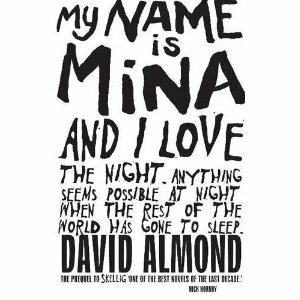 What follows is an amazing story in which Almond did what he does best, finds the extraordinary in ordinary things. Perhaps the strongest character in Skellig is Mina, a quirky, bizarre, friendly philosophical young girl who befriends and helps Michael. So strong a character in fact, that her voice has followed Almond throughout his writing career, until at last her story has been published in 'My Name Is Mina'. This is an incredible, chaotic, shining novel written in Mina's voice through her notebook. She gives us glimpses of her own troubled, yet joyous life, as well as observations of nature, human behaviour and her near obsession with William Blake (impressive for a ten-year-old). And yet the voice is completely genuine, never once veering from it's tone and character. A total joy to read! I'm also giving you the link to David Almond's own website. Here, among other interesting things, you'll find all of Almonds books spanning his career. Each one is wonderful and extraordinary in their own right. Just a quick reminder to you all: voting closes for the 'Queen of Teens 2010' on 31st August.So if any of you out there have forgotten to vote, or have been having trouble making up your mind, NOW is the time. There is some pretty tough competition on the shortlist....so....who's it going to be? Cathy Cassidy? Sarah Webb?? Jacqueline Wilson????.... follow the link and vote now, if you haven't already! Here's a link for the brochure of this year's Mountain To Sea Festival. More authors and events per square foot than you have ever imagined... and an absolutely magnificent children's line-up, as well. Personally, while I'm working that weekend, you may just mind me stalking some my favourites in the middle of the week. There's Cathy Cassidy, Michael Scott, our own Sarah Webb..... my great sadness is that due to work commitments, I'll be missing Kate DiCamillo. Will someone please stalk her for me and get her to sign a copy of 'The Miraculous Journey of Edward Tulane? Just as I was thinking I'd should get off the pc and go to bed, I discovered the Bath Children's Literature Festival brochure is out, and I had to tell you all about it! Bath (my favourite city in the entire world!) is hosting it's 4th annual Children's Literature festival from Friday, 24th September through Sunday , 3rd October. This year's line up includes:Anthony Browne (UK's Children's Laureate), Andy Stanton (of Mr. Gum fame), Tony Ross, Chris Ryan, Jeanne Willis and Gwen Millward, Cressida Cowell, Alan Gibbons, David Almond (his new book...the long-awaited 'My Name Is Mina' is wonderful! ), Cathy Cassidy, and Cornelia Funke making a return visit to celebrate her new book 'Reckless'....so many children's authors that it would take me about 3 pages to list them! This year, the festival has launched it's first ever children's writer in residence; Bath based author Julia Green (I love 'Breathing Underwater' and 'Drawing With Light'. Below is the link to download the brochure, so you can have a look for yourself. And before I forget, on Sunday October 3rd, there are celebrations for...the Moomins' 65th birthday!!! Emma Thompson and Peter Rabbit? 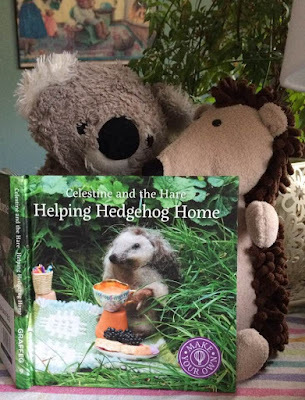 While talking to US chat show host Craig Ferguson, Emma Thompson stated that she had received "a lovely little job offer" from the publishers of a children's book series. 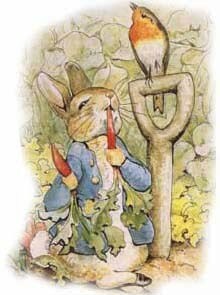 As it happens, Thompson has been in talks with Frederick Warne to pen a new Peter Rabbit story commemorating 110 years of Peter Rabbit. "They asked me to write a new story, so I'm going to take him to Scotland," she said. She recently admitted that she was planning to take a break from acting. 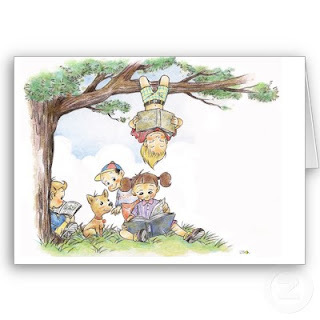 Well known for her many stage and screen roles, including that of Nanny McPhee, Thompson's book is expected to be published by Warne in 2012, just in time to say Happy 110th Birthday, Peter Rabbit. By the way, for any Peter Rabbit fans out there, Here's the link to the official Peter Rabbit website. Also from the Guardian, this time from the 9th August, is this lovely article about Linda Newbery and her inspiration for her latest book 'Lob'. I absolutely loved this book for younger readers. The larger print makes this gentle, magical story perfect for the newly competent reader, and for reading aloud at home or in the classroom. The issues that it deals with are presented with loads of room for discussion, relating to and expanding on... or just for pure enjoyment. It's one of those books that will stay with you forever...regardless of your age when you read it. Why Are American Writers So Good At Coming-Of-Age Novels? Here's a link to a wonderful article in today's Guardian Book Blog, posted by Imogen Russell-Williams. The content of the article basically cites a capacity, or gift perhaps, among American writers to create stunning coming-of-age novels, such as the current favourite of mine, 'The Sky Is Everywhere' by Jandy Nelson. It seems to be a literary tradition of sorts when you consider such greats as 'Catcher In The Rye' and 'To Kill A Mockingbird', etc. Considering I think on my personal favourite novels of this genre, I have to admit, the writers that spring to mind are all American...or at the very least, ex-pats. It's interesting to ponder why the US seems to have given birth to masters in this field. But I will also add that I am currently reading an advance copy of 'Prim Improper' by Deirdre Sullivan...very shortly to be released by the magnificent Little Island Imprint (www.littleisland.ie - but more about them later). Every bit as good at the genre as any US author I can think of...and she's Irish! Also, here's a link to the "recklessthebook" via Chicken House in the UK. On this site is a link to Cornelia Funke reading in London, as well as a few other bits. Enjoy! I am so incredibly excited about the upcoming release of "Reckless" by Cornelia Funke! Due to be published next month, "Reckless" is the first of a new trilogy set in the fairy tale world imagined by the Brothers Grimm....with a unique twist. I was given a proof copy to read and have to say...this is going to be great! The link below gives details on Funke's "Reckless" tour - complete with dramatic readings and music. I'm sorry I'll miss it, as it will be happening in the US. For those of us further afield, however, the New York event, happening on September 14th ( the day of the launch) will be live-streamed on the Reckless Web site. I know what I'll be doing on September 14th. Before I forget completely, I just want to give a quick plug to this great website, www.mykidstime.ie. Here you'll find activities, classes, events, reviews and a host of other services designed with children and their families in mind. They've developed blogs for nearly every region in the country, keeping you informed of what they've been up to when out and about, and what you should be watching out for. Here's the link for the Galway region, but you can access all other regions easily on the page. So have a look for yourself. The promised Cave Baby website is now up and running... and it's brilliant!!!! There are activities to download. You can paint your own cave wall (again and again!). There's a great video of Emily Gravett drawing Cave Baby, a sneak peak at the book and links to other sites... the wonderful Emily Gravett site and the Gruffalo site. Fantastic isn't a strong enough word! Many thanks to Jandy Nelson, who pointed this article out on her facebook page. The New York Times published this essay in the Sunday Book Review today (I know.... it's Friday) about the current popularity of Young Adult books with those of us who can no longer claim to be young adults. The essay pointed out that the Harry Potter generation has grown up, graduated from Hogwart's and now is looking for something a bit more mature. But among the reasons cited for the 'older' audience of YA books is one very important aspect..... one that I have always suspected and share with many people who have commented on my (near obsessive) interest in YA and children's literature, in general. (Ninety per cent of my reading material falls into these two categories. No apologies.) Very simply, YA and Children's books know how to, and value, the aspect of storytelling in literature. These writer's know how to craft a story, develop characters and relationships and maintain the integrity of the plot. Among the children's authors praised in this essay are Susan Cooper, Eoin Colfer and Rick Riordan. Brilliant! While I was persuing the papers, I came across this from the Guardian today. In a continuing celebration of Puffin imprint's 70th anniversary, Seven Stories in Newcastle upon Tyne has been hosting a brilliant exhibition (well, all the exhibitions there are brilliant). Today online, The Guardian has published a selection of letters from the archive of Kaye Webb. Kaye Webb worked (tirelessly) for almost 20 years as editor for Puffin, where she instituted the picture-book imprint, founded the Puffin Club and worked with many of the authors we grew up with and still love today. Please click on the link below. There are only a few bits here, but they are wonderful to see. And here's a link to the Seven Stories site, as well. For those who don't know, Seven Stories is the first museum in the UK solely dedicated to the art of children's books. And it is a great place to go. There have been some really great reviews of children's books this weekend. First of all, checking out the Irish Times from Saturday, 31st July, we have some of Ireland's best known authorities on children's literature inspecting what's new and exciting for all age levels. Robert Dunbar covers some of the more gritty and shocking books for young adult readers. His initial perusal is of Forbidden by Tabitha Suzuma. With the question being "So nothing is taboo any more? ", this book sets the tone of the rest on offer in Dunbar's review. Also covered in Dunbar's article are Keith Gray's anthology Losing It (included the foremost authors of young adult fiction today); Margo Lanagan's White Time, iBoy by Kevin Brooks (always a great and compelling author) and Matt Haig's The Radleys. A truly exciting line up, all well written, but still shocking. Mary Shine Thompson has a good look at some of the best of children's books for the 10-12 range, beginning with Artemis Fowl and the Atlantis Complex by Eoin Colfer. Thompson says "Few writers are as witty and technically adroit or have developed a protagonist with such skill and understatement." Among the other books she covers is my current favourite, Timecatcher by Marie-Louise Fitzpatrick, which she calls "a fast-paced novel, full of surprises." Brilliant. Also, Thompson offers us a look at Michael Scott's The Necromancer and the upcoming My Name is Mina by David Almond, among others. And in 'The wonderful magic of miniature worlds', Anna Carey examines picture books. April Underhill, Tooth Fairy by Bob Graham; Anthony Browne's Me and You, Arthur and the Meanies by Jan Fearnley and quite a number of other marvelous picture books are included. Moving on to The Guardian (31st July), Julia Eccelshare suggests books for all ages in her 'Summer reading for children'. Among her picks are the beautiful Cave Baby by Julia Donaldson and Emily Gravett, Harry and Hopper by Margaret Wild, Jenny Valentine's Iggy And Me On Holiday for young readers, the marvellously funny Vamoose by Meg Rosoff, and the exquiste The Sky Is Everywhere by Jandy Nelson (a must read in my view, and a welcome antidote for the infestation of vampires we've been having*). Of this book, Eccleshare says, " How grief and love run side by side is sensitively and intensely explored in this energetic, poetic and warm-blooded novel." *It's not that I don't like vampires as a general rule,. It's simply that there have been far too many of them and, as far as I'm concerned, they are displaying in very un-vampire-like qualities.